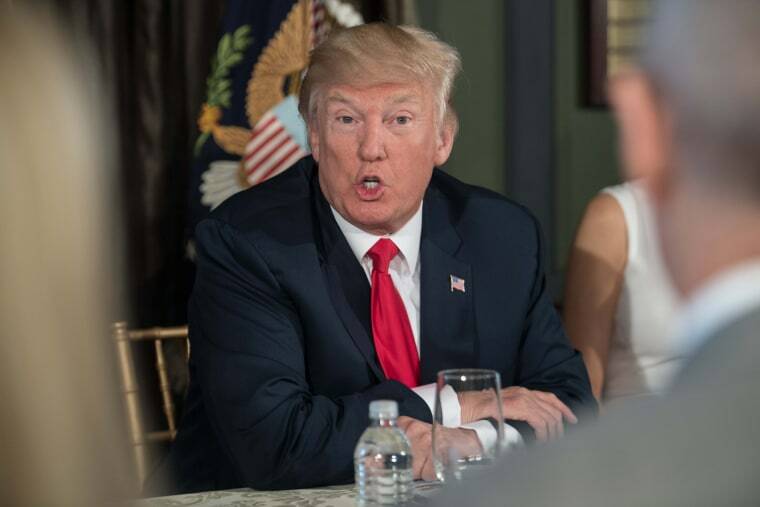 WASHINGTON — Amid sharply escalating tensions with North Korea, President Donald Trump on Tuesday promised "fire and fury like the world has never seen" if the country continues to threaten the United States. "North Korea best not make any more threats to the United States," the president warned, responding to a reporter's question at his Bedminster Golf Club, where Trump has spent the last several days. "They will be met with fire, fury and frankly power the likes of which this world has never seen before." Trump's remarks came just hours after reports that North Korea had developed a nuclear weapon small enough to fit on a missile — and the White House said Wednesday "the words were his own." "General Kelly and others on the NSC team were well aware of the tone of" the president's statement before it was delivered," White House Press Secretary Sarah Huckabee Sanders said Wednesday, stating that both "the tone and strength of the message were discussed beforehand." The president and his chief of staff have been in "constant contact" with members of the National Security team while on a "working vacation" in Bedminster, New Jersey, according to Deputy White House Press Secretary Lindsay Walters. Defense Secretary James Mattis, in a statement on Wednesday, urged North Korea to "stop isolating itself and stand down in pursuit of nuclear weapons." "The DPRK should cease any consideration of actions that would lead to the end of its regime and the destruction of its people," the statement continued. "While our State Department is making every effort to resolve this global threat through diplomatic means, it must be noted that the combined allied militaries now possess the most precise, rehearsed and robust defensive and offensive capabilities on Earth," Mattis said in the statement, warning that any North Korean action would be "grossly overmatched by ours." U.S. officials believe North Korea now has the capability to put a nuclear weapon on a missile, NBC News reported on Tuesday, confirming a report in The Washington Post. According to a U.S. official briefed on the assessment, the advance does not mean North Korea has a nuclear-tipped intercontinental ballistic missile (ICBM) that can survive reentry accurately. Last month, North Korea proved its missile capabilities have reached a point where U.S. cities are within "target range." The Dow dropped Tuesday, in response to the president's warning, thus ending a 10-day streak of nine record closes in a row. In dealing with North Korea, the Trump administration has relied heavily on China to intervene with Pyongyang and convince Kim to stop his nuclear program, but outreach and action have stalled in recent months. Top White House advisor Kellyanne Conway called Trump's remarks on North Korea "strong and obvious," declining to comment further on the strategy while briefing reporters in New Jersey on the administration's efforts against the opioid crisis. The White House continues to insist that all options are on the table in dealing with North Korea. Sen. Dianne Feinstein, D-Calif., criticized Trump's comments as further isolating North Korea — a strategy she says has not worked to advance American goals in the region. And Arizona Sen. John McCain said he took "exception to the President's comments because you've gotta be sure you can do what you say you can do." Ret. Navy Admiral James Stavridis, in an appearance on MSNBC Tuesday, called the escalation with North Korea the "biggest crisis" that this Trump administration has yet to face on the global stage. Trump has previously vowed to confront North Korea "very strongly" for testing missile launches, telling reporters during a trip last month to Warsaw, Poland that "I have some pretty severe things that we’re thinking about," in terms of potential responses. While Trump has said he does not "draw red lines" — a criticism he often levels of former President Barack Obama's stated threshold in Syria — Trump's comments Tuesday seem to draw a line at continued threatening rhetoric from North Korea.